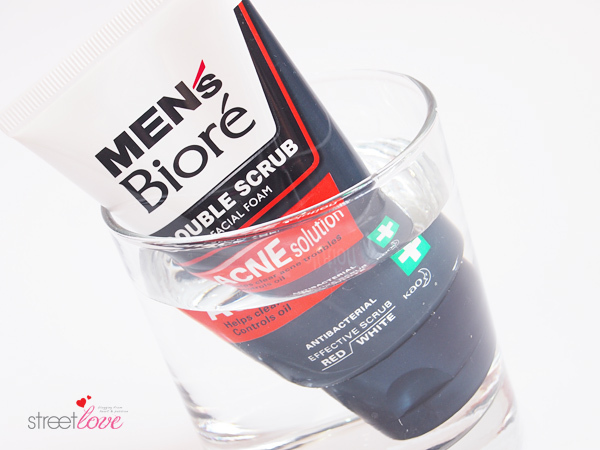 Men’s Bioré Double Scrub Acne Solution Facial Foam is the newest edition as an extension to the brand’s newly launched Double Scrub range. Double Scrub is a range that offers specific skin care solution ranging from Deep Cleanse, Oil Control and Whitening to take care of those stubborn blackheads, oily complexion, dull complexion and of course, anti-acne solution. Double Scrub Acne Solution Facial Foam is designed and formulated for men to combat common men skin concern such as acne, oily skin and dull complexion. What it does is to go deep into the skin or pores, cleanse all the oil and dirt which is known to clog up pores and acne breakout. 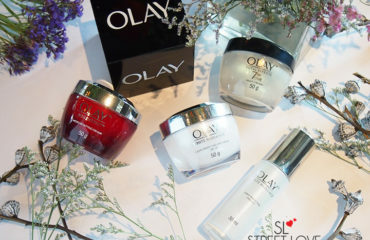 As you know I’m the skin care provider for my mum and now my brother as well. He uses my cleanser in the bathroom, which I’m alright with since I have 86545700633 tubes of cleanser up on the vanity rack. I was particularly telling him to use the whitening version as he does have quite a bit of acne marks from breakouts. What both of us didn’t know is he is somehow allergic to certain whitening substance that he kept getting more breakout (guilty me!). He managed to pinpoint out that it’s the cleanser that gave him continuous breakout that he switched to other cleanser and now he’s full on this Men’s Bioré Double Scrub Acne Solution Facial Foam. A few days ago I posted a yucky picture of a used Bioré Pore Pack Black together with all the blackheads extracted from my nose at my Instagram fionastreetlove. A very dear reader, Melissa Ting requested for me to blog on which is the best nose pore strip that I have used before as she is looking to buy one. Now, you must be thinking why would a recommendation needed for pore strip. Trust me. You need to as not all pore strip works in extracting all the gunk out from the nose. I have decided not to do a comparison review between pore packs because it does take some time for the nose area to get all clogged up. I’m not going to let Melissa to wait for a month of two for a review 🙂 . So Melissa here’s one. Bioré pore pack failed on me previously so I stay away from them. 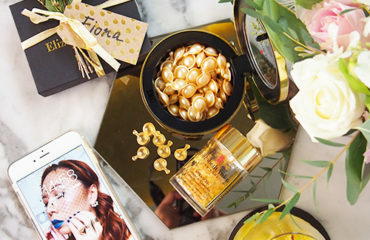 A recent Cleo magazine haul re-introduced me back to Bioré Pore Pack and it’s the Bioré Pore Pack Black. Needless to say I went to Guardian pharmacy and bought a 10 strips pack. 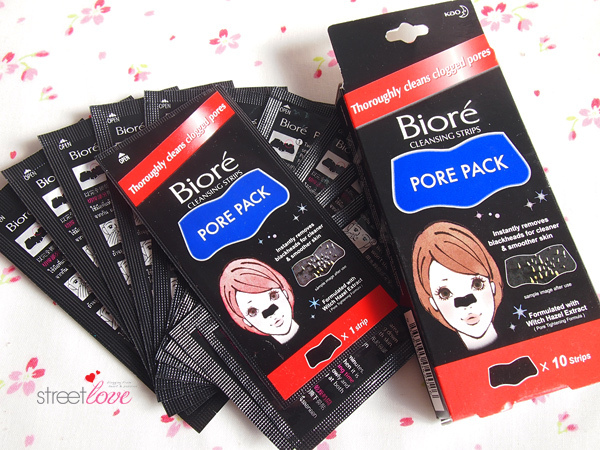 There is two types of Bioré pore pack available – white and black. Since the white one failed on me and black one works like a charm, I repurchased the Bioré Pore Pack Black. Once you have chosen which type of pore pack suits you, you will then have a choice to choose either a 5 strips pack or a 10 strips pack. I bought the 10 strips pack since it only cost me RM9.88 per pack. The one makeup remover that I’ve gone through bottles and bottles 2 years ago is the Bioré Cleansing Oil. 2 years ago I hated cleansing oil. I never knew about cleansing milk before and cleansing oil is the only product that was introduced to me. I hated it for being oily and messy. I hated it for being such a troublesome to use. I hated it for leaving my face oily and yucky. 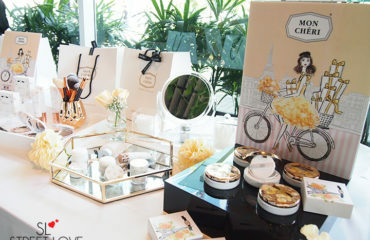 Then I get to know about cleansing milk all thanks to Clarins and I was on the cleansing milk bandwagon till to date. 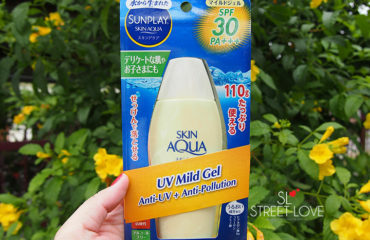 Last year I went for a budget shopping at Watsons for the blog. If you missed the post, click here. 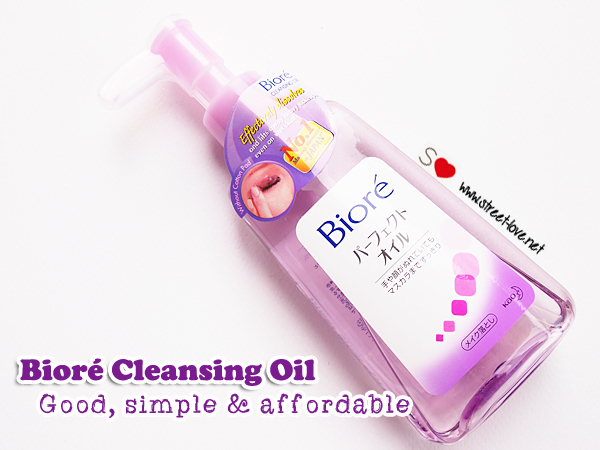 One of the item that I picked up is the Bioré Cleansing Oil. And of course I need to use all the products I bought so I did. Slowly. Earlier this month I took out the Bioré Cleansing Oil to use and it actually felt really good on my face. I tried to recall why I fell off the bandwagon and hated it because it was really good. My guess is I have no proper idea how to use the product. So here I am; totally into cleansing oil. I reached for this or my Eve Lom Cleanser (also emulsify to oil) to remove my makeup leaving all my cleansing milk sitting at one corner. Awww I promise I’ll be back milky! I like that the bottle pump is never faulty, it pumps sufficient product out and comes with a plastic stopper for travelling. 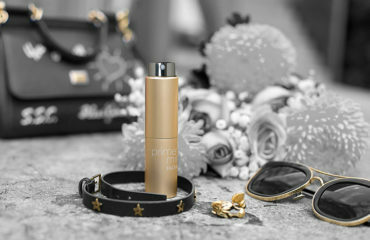 The nozzle is slim and long which I appreciate very much. I hate hate hateeee short nozzle because that means my hands would need to be placed nearer to the bottle body and there’s a high possibility that I’ll splash some of the oil onto it. You know I’m a bit of a clean freak with my skin care right? Bioré received a high recognition and recommendation when it comes to their makeup remover range. Not really a winner in skin care range but maybe their cleansing range are from Japan so it’s pretty good! I’ve tried their Cleansing Oil before converting everything to Clarins which I don’t know why I stray away but I’m back to it. I did a rounding in Watsons a few months back and started filling my basket with all sorts of good budget buy products. Along that I included Bioré Makeup Remover For Eye & Lip in my shopping basket and boy I’m glad I did! I always emphasis on a bi-phase eye makeup remover. That’s how I like it to be. I’ve tried all sorts of texture but bi-phase still works the best in terms of removing, conditioning and most important the efficiency. Usually for bi-phase removers you can see 2 layer of content. The “oil” floats on top while the water etc is at the bottom. A few weeks ago I asked you a question in Facebook if you are willing to spend on expensive makeup remover and most of you said you’re not willing to. There’s a reason behind the question actually. A year ago not only I’m not willing to spend on expensive skin care and makeup I definitely won’t splurge on makeup removers. After spending so much on expensive makeup removers I’m cutting down a bit on the splurge side while implementing some budget buy in. 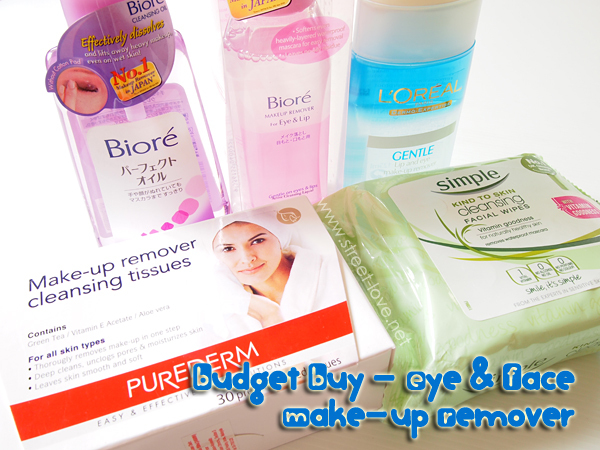 I’ve grabbed some of the best budget makeup removers from a local drugstore; Watsons that I’ve tried previously. Here’s what I think. 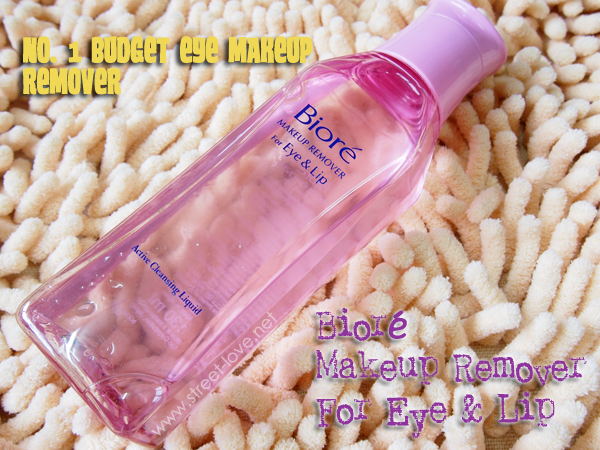 Redeem the New Biore Makeup Remover for Eye & Lip Sample for FREE! 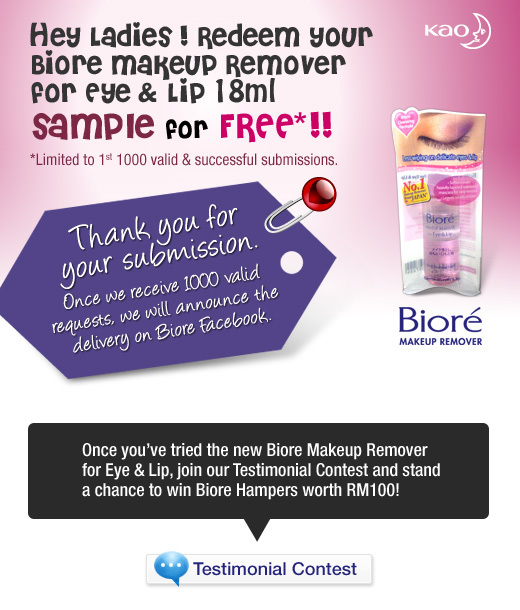 Join Biore Facebook now to redeem the new Biore Makeup Remover for Eye & Lip 18ml sample for FREE! * Limited to 1st 1000 valid & successful submissions. 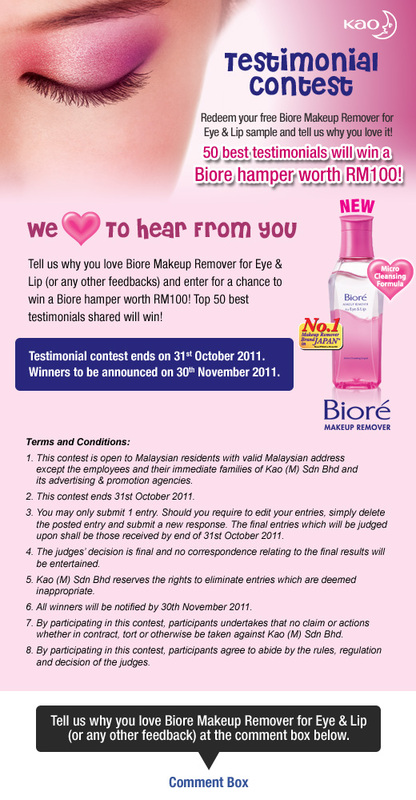 Once you’ve tried the new Biore Makeup Remover for Eye & Lip, join the Testimonial Contest and stand a chance to win Biore Hampers worth RM100!